Save the Corals of Puerto Rico. Islands Under Fire explores how the need to protect our fragile marine environment can bring meaning and direction to a young person’s life. It’s also a portrait of a relatively unknown part of America: Puerto Rico and the Spanish Virgin Islands. This is the little known story of how the US Government, in particular the Navy, almost destroyed pristine coral reefs to provide a target for gunners. The author’s humorous look at his role in the sometimes absurd tale of how locals, politicos and mariners came together to save the reefs is a lesson for us all. The conservation efforts represent a perfect example of what highly-motivated citizens and political leaders can achieve when taking action to protect what they love. In the case of the Culebrans, their tranquil island paradise was being shelled into oblivion by the US Navy. The author, hired as captain of a small research vessel, led the underwater search for evidence of the coral reef damage that would be used to convince the US Government to stop its bombardment of the island. His role enabled the Culebrans to gather proof of the destruction that ultimately convinced everyone, including President Nixon, to stop the carnage. "Kevin McCarey is an imaginative talent with a gift for the magical and mystical. His writing reveals a rich understanding of Puerto Rico and its people - reveling in their humanity and their eccentricities." "This memoir, part travelogue and part natural history, is rich with humor, misadventure, and triumph. McCarey's writing is a pleasure, his penchant for simile and skill with dialogue particular delights.... 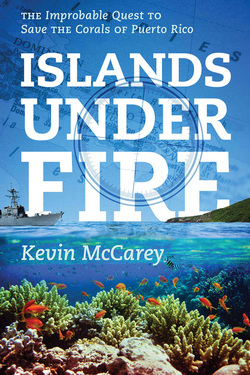 Readers will learn about the history of Puerto Rico, its marine ecology, political landscape, and a bit about boats as well—all of which McCarey folds seamlessly into his fine seaman's tale... McCarey's maiden voyage into contemporary maritime non-fiction is an engrossing and joyful trip." Chris Palmer, author of Shooting in the Wild.